Abidjan, November 15, 2018 - Endeavour Mining (TSX:EDV)(OTCQX:EDVMF) is pleased to announce a significant maiden resource estimate for the previously announced Kari Pump discovery at its flagship Houndé mine in Burkina Faso. Kari Pump, located only 7km west of the processing plant, is one of three high-grade discoveries made in the large Kari gold in soil anomaly which covers a 6km-long by 2.5km-wide area. A total of 203,900 meters have been drilled over the past 18 months, covering only 35% of the anomaly, with drill results previously announced on November 13, 2017, and May 24, 2018. Since May 2018, efforts have focused mainly on the Kari Pump discovery, with over 71,000 meters drilled to extend and in-fill its mineralization, which has led to the successful delineation of a maiden resource. In addition, over 20,000 meters were drilled on the Kari Center and Kari West discoveries, for which a maiden resource is expected to be delineated in 2019. The Kari Pump maiden resource estimate has increased Houndé's Measured and Indicated resources by 40%, as presented in Table 1 below, while adding high-grade material. The Kari Pump maiden resource covers an area 1.3km long by 0.8km wide and remains open towards the east, north, northwest and southwest. Due to the intensive in-fill drill program completed, 98% of maiden resource has been classified to the indicated category. As the mineralization starts at surface, it is amenable to open pit mining. In addition, approximately 45% of the indicated resource is located within the oxide and transition zones, compared to most of the Houndé indicated resource located in fresh zones. Mineral Reserve estimates follow the Canadian Institute of Mining, Metallurgy and Petroleum ("CIM") definitions standards for mineral resources and reserves and have been completed in accordance with the Standards of Disclosure for Mineral Projects as defined by National Instrument 43-101. Reported tonnage and grade figures have been rounded from raw estimates to reflect the relative accuracy of the estimate. Minor variations may occur during the addition of rounded numbers. Mineral Resources that are not Mineral Reserves do not have demonstrated economic viability. Resources were constrained by MII 1500$/oz Pit Shell and based on a cutoff of 0.5 g/t Au. For the notes related to the Houndé Mine resource estimate, please consult the March 13, 2018 press release available on the Company's website. The Houndé Mine Mineral Resource is inclusive of Houndé Mine production of 201,390 ounces of gold between December 31, 2017, and September 30, 2018. The updated Mineral Resource has an effective date of November 1, 2018, and is current as of December 31, 2017. Another aggressive 200,000-meter drill program is expected to start before year-end focused on extending the mineralization of Kari Pump and delineating a maiden resource for both the Kari West and Kari Center discoveries, in addition to testing other nearby targets. Sébastien de Montessus, President and CEO, stated: "The maiden resource announced today at Kari Pump is extremely encouraging. The size and high-grade nature of the resource confirms Houndé as a world-class asset with significant exploration potential to extend its status as a long-life, low-cost flagship mine within our portfolio. I would like to congratulate our Houndé Exploration team for its commitment, enthusiasm and professionalism and to thank them for their efforts which are bearing fruit today. It is impressive to delineate a maiden resource with more than 98% classified in the indicated category and at a discovery cost of just $9/oz." Patrick Bouisset, Executive Vice-President Exploration and Growth, stated: "We are very pleased with the maiden resource at Kari Pump as it confirms the high potential we see at Houndé. With over 200,000 meters drilled, processed and analyzed in less than 18 months over the Kari area, our team has proven the ability to deliver quickly on high-priority targets. Looking ahead, we are excited by the upside potential in the wider Kari area and the other regional targets. As such we have launched another intensive 200,000-meter drill campaign with the goal of quickly delineating more resources. More broadly, the exploration success achieved notably at Kari Pump, Ity and Fetekro just two years since the implementation of our 5-year strategic exploration plan in late 2016, demonstrates that we remain on track to reach our ambitious discovery target set at a discovery cost lower than $20/oz." 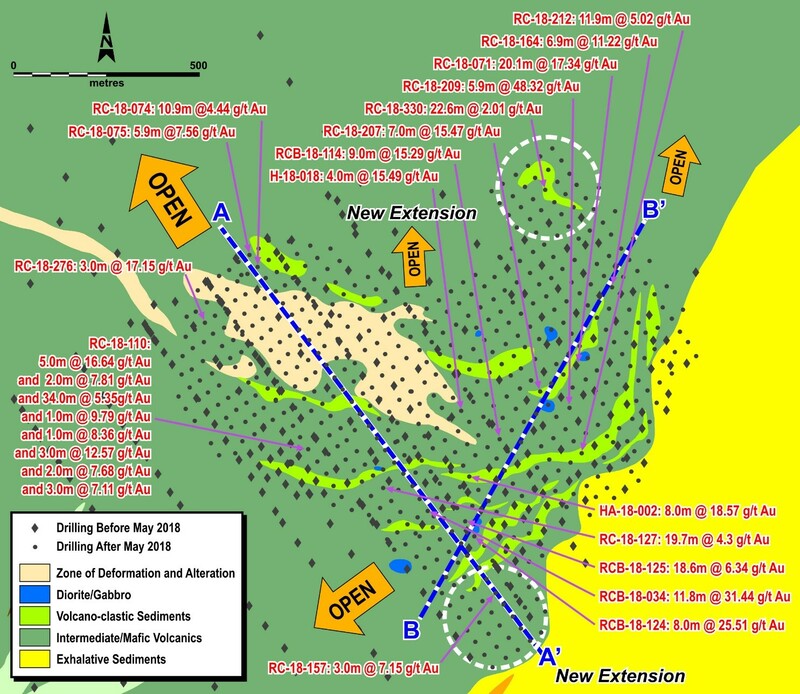 Following the decision to develop the Houndé mine, exploration resumed in early 2017 with an initial reconnaissance drilling campaign prioritizing various targets identified during the 2016 exploration strategic review. In 2017, the campaign validated Houndé's significant exploration potential as high-grade mineralization was intercepted at the Kari, Sia/Sianikoui, and Bouéré extension targets. Given the potential size of the Kari gold in soil anomaly, which covers a 6km-long by 2.5km-wide area, the target was identified as a top priority and an extensive drill campaign was launched. As shown in Figure 1 below, the Kari area is located only 7km west of the processing plant and in proximity to an existing haul road that will be used to transport ore from Bouéré. Over the past 18 months, a total of 2,237 holes have been drilled (comprised of 1,431 AC, 716 RC and 90 DD) amounting to 203,900 meters, on an area which represents only 35% of the large Kari gold in soil anomaly. In 2017, most of the initial reconnaissance drilling focused on the Kari Pump target with a total of 337 AC holes totaling 30,460 meters, 23 RC holes totaling 3,400 meters, and few DD holes. The follow up drilling campaign which started in late December 2017 and ran until May 2018, consisted of 1,020 holes totaling 78,400 meters comprised of 900 AC reconnaissance holes totaling 63,500 meters and 120 RC holes totaling 14,900 meters. This campaign extended the Kari Pump mineralization and outlined the Kari West and Kari Center discoveries, as published on May 24, 2018. Mineralization at the Kari West discovery extends at least 1.0 kilometers along strike and across a width of 500 meters while the mineralization at the Kari Center discovery extends 1.2 kilometers along strike and across a width of over 200 meters. Since May 2018, a follow-up drilling campaign, consisting of 573 RC holes totaling 61,537 meters and 69 DD holes totaling 10,106 meters, has been conducted on Kari Pump. In addition, a follow-up drilling campaign consisting of 205 AC and RC holes totaling 20,074 meters has been conducted on the Kari Center and Kari West discoveries, for which a maiden resource is expected to be delineated in 2019. Another intensive 200,000-meter drill program, comprised of Air Core ("AC") reconnaissance, reverse circulation ("RC"), and diamond drilling ("DD"), is expected to start before year-end focused on extending the mineralization of Kari Pump and delineating a maiden resource for both the Kari West and the Kari Center discoveries. In addition, drilling is also expected to be done on new targets in close proximity to the Vindaloo pit (currently being mined) and on other nearby targets. 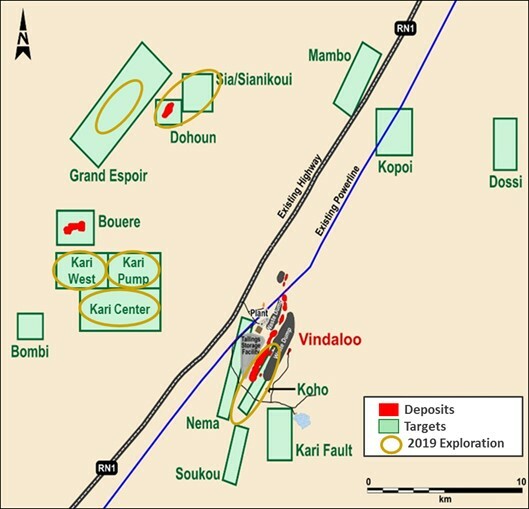 Since May 2018, exploration efforts at Houndé have mainly been focused on the Kari Pump discovery, with over 71,000 meters drilled to extend and in-fill its mineralization which led to the successful delineation of a maiden resource. Due to the intensive in-fill drill program completed, based on a 40m by 40m drilling grid, 98% of the maiden resource has been classified to the indicated category. The drilling program was very successful, as over 84% of the drilled RC and DD holes encountered at least one interval of mineralization of 0.5g/t Au with a minimum width of more than 2 meters. In addition, the average drill hole intercept amounted to 6.54 meters at 3.01 g/t Au uncapped. The Kari Pump maiden resource covers an area 1.3km long by 0.8km wide and remains open towards the east, north, northwest and southwest. As the mineralization starts at surface, it is amenable to open pit mining. In addition, approximately 45% of the indicated resource is located within the oxide and transition zones, compared to most of the Houndé Indicated resource located in fresh zones. A sensitivity analysis performed at a gold price of $1,250/oz demonstrates the robustness of the Kari Pump resources model due to its shallow and high-grade mineralization, as shown in Table 2 below. No Measure resources have been estimated. Mineral Reserve estimates follow the Canadian Institute of Mining, Metallurgy and Petroleum ("CIM") definitions standards for mineral resources and reserves and have been completed in accordance with the Standards of Disclosure for Mineral Projects as defined by National Instrument 43-101. Reported tonnage and grade figures have been rounded from raw estimates to reflect the relative accuracy of the estimate. Minor variations may occur during the addition of rounded numbers. Mineral Resources that are not Mineral Reserves do not have demonstrated economic viability. Resources were constrained by MII 1500$/oz Pit Shell and for sensitivity purpose by MII 1250$/oz pit shell and based on a cutoff of 0.5 g/t Au. Geologically, Kari Pump is underlain by andesite flows with minor volcano-sediment and sediments that are locally intruded by few diorite sills. Gold mineralization occurs within a sheared reverse fault (D2) that appears to be folded and dipping from 0-40 degrees to the west-northwest and northwest. Observed clear alteration consists of pervasive creamy sericite, intermittent rhodochrosite, chlorite seams and pyritized quartz/carbonate veining. The laterite and saprolite are relatively thick at Kari Pump with an average thickness which is ranging from 50 to 85 meters. As shown in Figures 3 and 4, mineralization exhibits excellent continuity over the 1.3km long section and displays its typical pinch and swell characteristics with often very high-grade quartz veining systems over significant thickness alternating with thinner intercepts associated with more moderate grades. Kari Pump mineralization has also been significantly extended since May 2018 and exhibits now some significant intercepts in the oxide section within the saprolite and in some instances very close from surface. Metallurgical tests on Kari Pump are underway and a reserve calculation will then follow. The statistical analysis, geological modelling and resource estimation were prepared by Kevin Harris, CPG. Mr. Harris is Endeavour Mining's V.P. Resource Manager and a Qualified Person as defined by NI 43-101. The Kari Pump resource model was developed in Geovia's Surpac software. A total of six mineralized zones were defined from the current drilling data and geologic interpretations across Kari Pump. The gold assays from the drill holes were composited to 1.0 meter intervals within the mineralized wireframes and capped at from 10 to 40 g/t Au based on the statistics of each mineralized zone. Spatial analysis of the gold distribution within the mineralized zone using variograms indicated a good continuity of the grades along strike and down dip of the mineralized zones and were used to establish ordinary kriging parameters. Density was measured in 4,016 core samples within the various rock types then averaged within the model by the weathered zones. The laterite density is 2.0, the saprolite is 1.8, the transition is 2.25, and the fresh rock is 2.74. The gold grade was estimated with the ordinary kriging method constrained within the mineralized domains. The grade was estimated in multiple passes to define the higher confidence areas and extend the grade to the interpreted mineralized zone extents. The grade estimation was validated with visual analysis by comparison with the drilling data on sections, comparing with inverse distance squared estimation, and with swath plots comparing the block grades with the composites. The mineralized domains were classified as indicated and inferred resource classifications depending on the sample spacing, number samples, confidence in mineralized zone continuity, and geostatistical analysis. Indicated classification was generally applied to blocks within the mineralized zoned defined by a minimum of six samples from at least three drill holes with a 50-meter search. Inferred classification is defined by a minimum of three samples within a 75-meter search from two drill holes. The resource was constrained by a $1,500 and a $ 1,250 pit shell and 0.50 g/t cutoff. The Whittle pit shell optimization assumed a base mining cost of $2.00 per tonne, and an adjusted ore mining cost of $3/tonne for oxide, $3.8 /tonne for transition, and $3.85/tonne for fresh rock. mining recovery of 95%, mining dilution of 20%, pit slope of 40o, gold recovery of 90% in oxide, transition and fresh rock, and processing and G&A cost of $16.20 per tonne for oxide, $17.50/tonne for transition, and $20.50 for fresh rock. Reverse Circulation drill samples were collected at 1-meter intervals using dual tube, a percussion hammer and drop center bit. Samples were split at the drill site using a 3-tier riffle splitter with both total and laboratory sample weights recorded. Wet samples were minimized, however if they occurred the entire sample was dried and split using the same method and equipment as the rest of the samples. A split of the sample was taken and kept for reference. Representative samples for each interval were collected with a spear, sieved into chip trays during the course of geological logging and stored in a secure location. Drill core (PQ, HQ and NQ size) samples are selected by geologists and sawn in half with a diamond blade at the project site. Half of the core is retained at the site for reference purposes. The average sample interval is approximately one meter in length and 2kg to 3kg in weight. All samples are transported by road to ALS Burkina SARL in Ouagadougou (Burkina Faso). A record of all stages of the sample transportation is documented for chain of custody purposes. Sample preparation includes, crushing the entire sample to 2mm at 80% passing and pulverizing a 1kg split to 75 micro meters at 85% passing. Samples are analyzed for gold using standard fire assay technique with a 50-gram charge and an Atomic Absorption (AA) finish. Assay results over 5 and 10 g/t Au are analysed by gravimetric and screen fire assay methods, respectively. Coarse blanks, field duplicates and certified reference material are inserted by geologists in the sample stream for quality control and to ensure there are adequate quality control samples in each fire assay batch. All aspects of sampling and assaying at Kari is monitored through the implementation of a quality assurance - quality control (QA-QC) program, compliant with NI 43-101 standards. Kari drill and QA-QC programs were audited in 2017 and the primary laboratory was audited in Q2 2018. Full drill results are available by clicking here. The scientific and technical content of this news release has been reviewed, verified and compiled by Gérard de Hert, EurGeol, Senior VP Exploration for Endeavour Mining. Gérard de Hert has more than 20 years of mineral exploration and mining experience and is a "Qualified Person" as defined by National Instrument 43-101 - Standards of Disclosure for Mineral Projects ("NI 43-101"). The resource estimation was completed by Kevin Harris, CPG, VP Resources for Endeavour Mining and "Qualified Person" as defined by National Instrument 43-101.